The latest chapter in the Amarr/Minmatar war ends with a mass exodus. After the Amarr’s Tier 4 push last weekend and Nulli Secunda’s departure, the Minmatar made short work of pushing the warzone back to Minmatar control. Many systems went vulnerable within a few days. Having had their cash-out, and seeing the warzone go up in flames once again, the Amarr militia retreated en masse. Some evacuated to the Caldari/Gallente warzone to try their fate with a change of scenery (and targets) whereas some, like Lost Obsession, left Faction War altogether. With pilots leaving the Amarr left and right, the Minmatar turned its attention to the front line over the weekend. Kourmonen and Lamaa were the first major systems to fall, with Kamela –a system steadfastly defended by the Amarr since before Inferno –quickly following. The Kourmonen area –once the primary hotbed of Amarr/Minmatar conflict, is now completely in the Minmatar’s control. Minmatar leadership has made it clear that the train will not stop until the entirety of the warzone has been turned over to the Minmatar –a scenario that will not take long to play out. After that, an altogether different chapter will begin for the Minmatar. With the Amarr beaten back, it is possible that they will need to look to other arenas for the pvp they crave. Or, perhaps the Amarr will begin a new chapter of their own. Even with so many leaving, we saw some new faces in the warzone –in particular, Agony Empire who did not pull any punches in Kamela over the weekend. In addition to these newcomers are some rather stubborn Amarrian groups such as I.LAW, who have made it clear they have no intention of leaving. I can’t help but respect these groups. It is so easy to make strong claims toward being willing to fight outnumbered and against extreme odds. It is much harder to continue on when the ‘extreme odds’ become a harsh reality—and when the majority of your friends have succumbed to this reality and moved on. I’ve been asked a number of times over the past weeks why anyone should consider joining the Amarr militia. To be honest, I couldn’t really think of a reason until now. But after this weekend, I think that a lot of the groups that have left the Amarr took some of the Amarr’s problems with them. 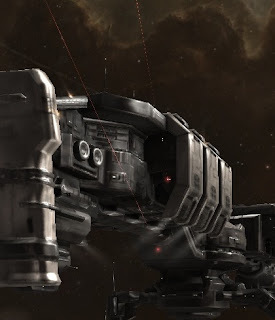 And, the wake of their exodus has created one of the most target-rich environments in EVE for solo and small gang pvpers—an environment that I believe many will (and should) be taking advantage of in the coming weeks. You're right about the target rich part - that was my main motivation for joining Amarr when I did, and the same is true for Agony to a great extent. The question I ask though is - why join Amarr given that you would join Caldari, still live and fight in the Amarr warzone if you want to (in fact do everything an Amarr member would do other than bash ihubs), but still have the LP payouts of Caldari? In the current Amarr environment, I think that being able to bash ihubs might be a little more valuable than it was before most of the names pulled out. If Amarr is going to make any kind of comeback they're going to need to start taking systems and encouraging the fair-weather players to come fight. As the minmatar showed, it is quite possible to have afk plex alts in other militias for isk, but stay in your main militia on another toon. For I.LAW, well, a lot of us are quite attached to Amarr. Further, this is an opportunity to show what we are capable of. Had a fight last night against six minnies with five in our gang. We killed four and I lost a rupture. Don't consider us defeated. Think of us more or less like the holdouts, the elite guard, the true Amarr. Not plexers or LP chasers, but fighters. Yes, the RP corp with about 10% RP-ers who consistently pwn face and pvp all the time. We have 62 members and about 7 of those ever RP. Yes that corp that gets kicked around lowsec like a old unloved toy. Wow. So says the anonymous guy. Thank you again for confusing PvE with PvP. Last I checked, I had 76 kills to like 4 losses. I guess that's me getting kicked around low-sec. Who are you again? Hahaha why don't u live in the warzone? As if running gunnless ships around a button has anything to do with pvp. Still anonymous. Sad little boy. Where I park at when I tire of killing you is of little relevance. Hahahaha u iLaw are so cute. You tell him Ryven....hate it when people talk under anonymous.